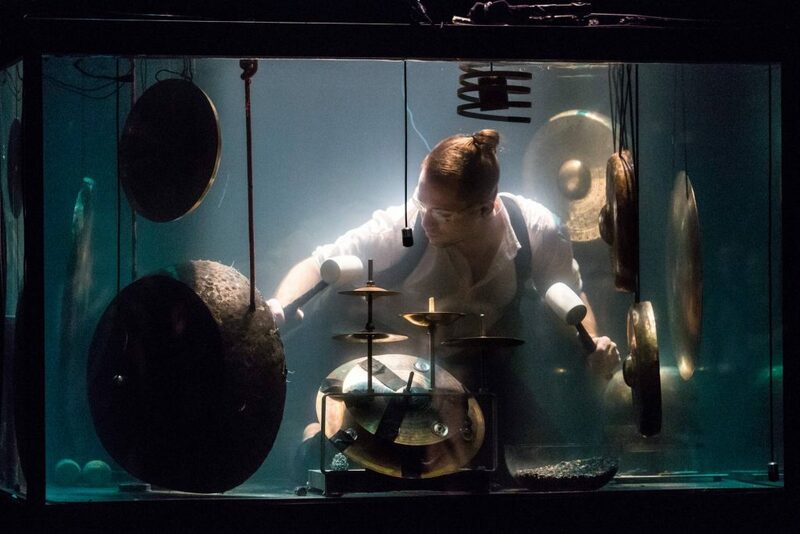 Five performers submerge themselves in glass water tanks to play custom-made instruments and sing entirely underwater. Transformed inside these darkly glittering, aquatic chambers, they produce compositions that are both eerily melodic and powerfully resonant. AquaSonic is the culmination of years of research into the exciting possibilities of submerged musical performance, breaking barriers and challenging existing paradigms. The artists conducted countless experiments in collaboration with deep-sea divers, instrument makers and scientists to develop entirely new, highly specialized subaqueous instruments. These include an underwater organ or hydraulophone, crystallophone, rotacorda, percussion and violin. The team also perfected a distinctive vocal technique for underwater singing. The result is a concert experience completely out of the ordinary; a deep dive into a magical new universe of images and sounds. After 10 years of work, AquaSonic had it’s world premiere in the Netherlands in 2016. It is now a viral phenomenon and the concert is requested all over the world.